Our Apartments and Townhouse are an affordable and ideal solution for an individual or family who is looking for a secure and friendly neighborhood. 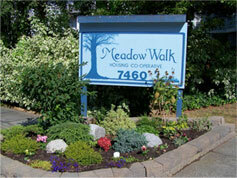 Located in the heart of Richmond, Meadow Walk Housing Co Op is a solidly built structure of wood and concrete floors. Just a few minutes walking distance to Minoru Park and Richmond Centre, you cannot get any more centrally located. Because of our co-op structure, we have many residents who have lived here for over 20 years. This is what co-op living offers, a secure, safe neighbourhood and a community where you can know your neighbors. If you are interested in joining us, please download our membership application form. The one-bedroom apartments are well laid out and fairly generously sized with a smallbalcony to provide enough space for a couple to live comfortably. The two-bedroom apartments are very well laid out and generously sized with a largebalcony to provide enough space for a couple and a child to live comfortably. The three-bedroom apartments are very well laid out for those with mobility needs andgenerously sized with a large balcony to provide enough space for a couple with childrenor a caregiver to live comfortably. Two styles of town-homes are available both three bedroom units, either on two floors or three. The two storey units come with a balcony while the three storey units have a small back garden patio. Information for 3 bedroom Wheelchair Accessible apartments available upon request.